MV Deep Andaman Queen Myanmar liveaboard features liveaboard dive expeditions to the Mergui Archipelago. She is 28 meters in length with a beam of 6.5 meters. The Deep Andaman Queen liveaboard takes 21 guests to the Mergui Archipelago each year from during our high season from October until May. The liveaboard cruises at 10 knots and carries plenty of fresh water and fuel to enable her to easily conduct short liveaboard scuba diving itineraries as well as longer scuba safaris. When she’s not cruising Burma, she’s diving in Thailand. She carries safety equipment for safe passage at sea including all necessary first aid kits, Oxygen, a DAN oxygen kit, a 25 person SOLAS life raft, and SOLAS life jackets. Her communication gear includes VHF radios, CB radios, a GPS, radar, echo sounder and mobile telephones. Deep Andaman Queen Myanmar liveaboard has one master cabin and five deluxe cabins on the main deck area. These cabins offer double-bed or twin-bed accommodation. 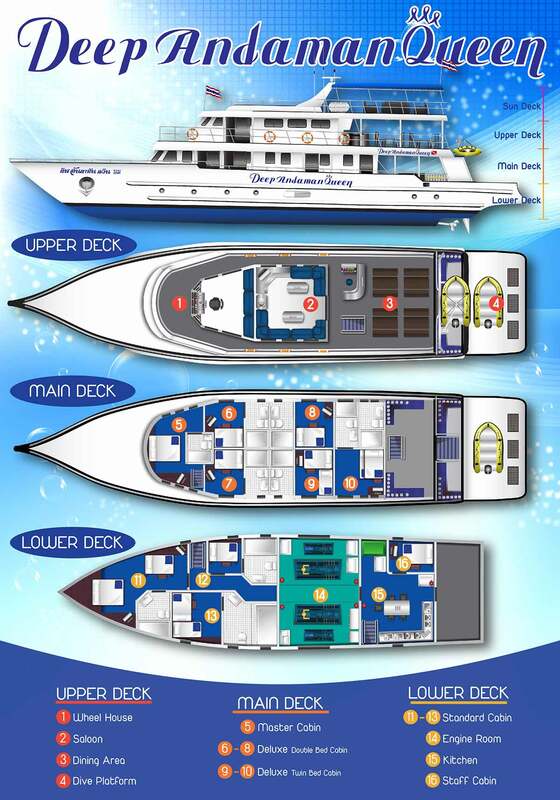 Three standard cabins are below deck; one double-twin, one triple-twin and one quad-twin. The cabins are priced according to comfort level: cheapest for the below deck cabins, medium priced for the deluxe cabins, and most expensive for the master. She has air conditioning and private en suite bathrooms for every cabin. Deep Andaman Queen Myanmar liveaboard operates both in Thailand and Myanmar (Mergui Archipelago.) Similan, Koh Bon, Koh Tachai and Richelieu Rock trips are five to six days in length. Mergui Archipelago, Myanmar trips are eight days and include dives in Thailand as well as Burma. She is available for individual bookings as well as charter cruises. Individual prices are listed below in the schedules. Please contact us for charter prices. All departures are from Phuket, Thailand, serviced by Phuket International Airport. The vessel departs from Thap Lamu, a port just north of Phuket Airport (HKT). Transfers are supplied to and from your hotel or the airport to the boat on departure day. 3) USD in cash only, no other currency is accepted by the Burmese. New bills only. *Upon booking, please send us a copy of your passport. We need to send this to the government in advance. Diving at Koh Bon, Koh Tachai and Richelieu Rock. Overnight to Kawthaung in Myanmar. Diving all day at Black Rock. Diving all day North Twin, Shark Cave and Stewart Island. Diving at North Rock, Fan Forest and Western Rocky. Diving at Western Rocky and head back to Kawthaung. Check out of Burma and back to Thailand overnight. Please note: Approximately 22 dives. Itineraries are for general information only. We make no claims to being 100% accurate as there are too many factors affecting the schedule. We will give you the best diving on the best spots we can each day.